The airfield services OccFld includes the performance of aviation operations duties, aircraft rescue fire fighting, and expeditionary airfield (EAF) equipment recovery duties. In addition to the required basic technical skills of the particular specialty, airfield services Marines must have the ability to work closely with others. 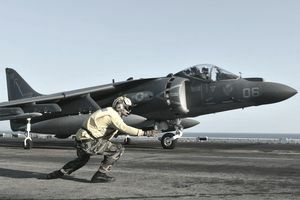 Airfield services Marines will be required to learn all facets of EAP equipment, clerical and administrative procedures pertinent to airfield operations or aircraft firefighting, and rescue techniques and equipment. Formal schooling is provided to Marines entering the OccFld. Entry-level jobs include work as an aircraft recovery specialist, aviation operations specialist or aircraft firefighting and rescue specialist. Marines entering this OccFld will receive MOS 7000, Basic Airfield Services Marine. They will participate in routine airfield services functions while training for a designated MOS within the OccFld.